For thousands of Americans, opioids no longer relieve pain — they cause pain. Known as "opioid tolerance," patients eventually become desensitized to opioids and more sensitive to pain after years of using the pain relievers. 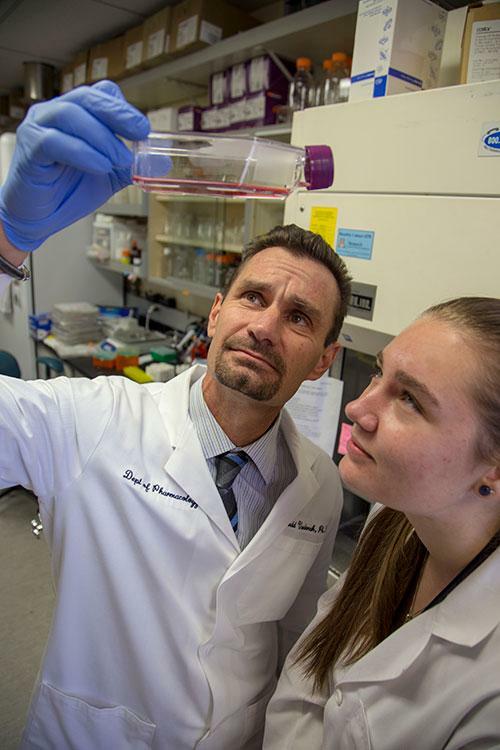 "Opioids inhibit pain and inflammation initially," said Todd Vanderah, PhD, professor and chair of pharmacology at the UA College of Medicine – Tucson. "But after a certain point, they start to promote pain and inflammation." "That's when doctors start to escalate a patient's opioid dosage — to keep this new sensitivity to pain at bay," Dr. Vanderah continued. "The problem is, over-prescription leads to bigger problems, like dependence, addiction and abuse." That's the goal of Drs. Vanderah and Daniela Salvemini, PhD, a colleague and professor at Saint Louis University. The two researchers believe they know what causes opioid tolerance and how to stop it from occurring. Now, with the support of a $1.7 million grant from the National Institute on Drug Abuse, Drs. Vanderah and Salvemini will work to verify their hunch is correct. "We've seen that sustained use of opioids increases the release of a specific type of lipid in the brain," Dr. Vanderah explained. That lipid, or fat, is known as sphingosine-1-phosphate, or S1P. Studies by the team have shown that high levels of S1P may induce opioid tolerance and sensitivity to pain in rats. If they are correct — and they can confirm that S1P causes opioid tolerance — the research team can then set its sights on a solution. Dr. Vanderah said a drug already is on the market that reduces S1P in the brain: fingolimod, which is used to treat multiple sclerosis. "Fingolimod already is targeting what we are looking at," Dr. Vanderah explained. "It decreases S1P activity and reduces inflammation in the brain that is tied to multiple sclerosis." Because fingolimod already is approved by the U.S. Food and Drug Administration, Dr. Vanderah believes it will be much easier to launch clinical trials that test the combination of fingolimod and opioids. Drs. Vanderah and Salvemini hope to launch a clinical trial testing the two medications in the next few years. "Opioid tolerance and dependence is a national crisis that is affecting thousands of Americans," said UA President Robert C. Robbins, MD. "This work is crucial, not only because it can show us how to potentially stop opioid addiction, but because it may mean relieving patients of their pain and helping them lead healthier, more active and fulfilling lives. This research is a great example of how the UA College of Medicine – Tucson is primed to be a leader in the future. Looking into developing new drugs, new diagnostics and new treatment options to care for patients in a more effective way is a vital part of succeeding in the Fourth Industrial Revolution."